Another day, much like the last two. Just sitting at home, monitoring various news sources, walking outside to cast worried glances up at the ridge, and waiting to see what the fire will do. taken about 12pm from our corner. We are currently under “voluntary evacuation” and so, of course, we are staying put. We do plan to leave if they make it mandatory, no stupid heroics here. We have packed cats twice now, thinking we were about to be told to leave, the latest happening late yesterday afternoon, when they blocked off our street and were only allowing people to walk in. They removed the blocks and went away a little later, so we uncrated the cats again. Mittens has now taken refuge under the wok in the kitchen cupboard, and will only come out for tuna or diced sauteed shrimp. Then he runs back into his wok cave. Tiki hid under my bed all night. another view of the ridge, slightly to the left. Last night the canyon up the road exploded in flames as the fire hit some brush or trees, and there were immense glowing red clouds and flames shooting tens of tens of feet into the air. We sat and watched it, horrified but also in awe of how terribly, destructively beautiful it was. Wish I’d gotten pictures but didn’t have my camera and wasn’t about to go get it. There was talk of extending the mandatory evacuation area down to about two blocks above our place, but the fire died down and they did not. 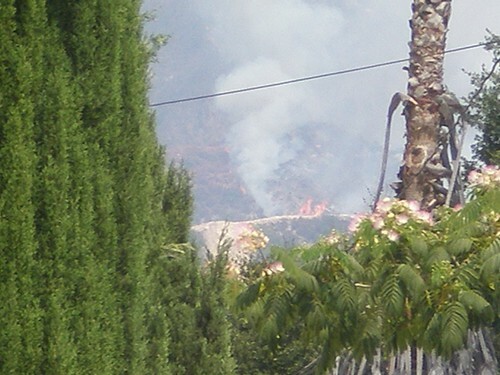 This morning it appears that there is one ridge left standing between the fire and various populated areas of Altadena. 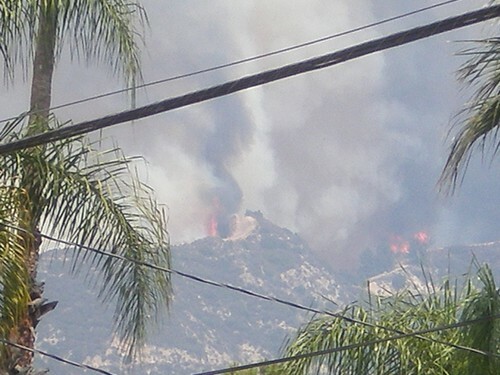 The fire came within 50 yards of homes in La Crescenta/La Canada Flintridge last night, and the firemen leapt into action! The homes were heroically saved. The firemen are valiant and amazing, working in weather that has exceeded 100 degrees for days in a row, without ceasing. We are so grateful to them! One of the problems they are encountering is that they can not get into the brush and dense mountainous areas so must wait for fire to burn down to them. They are so good at their jobs. We are taking cupcakes to our local FD and to the county FD by way of a thank you when this is all over. Water drop on the ridge, shot from my corner. Today we are cleaning the house and waiting to see what happens. We are not out of the woods yet, but we are not in any imminent or real physical danger at all right now. LAFD will evacuate well in advance of the fire and we are packed and ready to go at a moment’s notice. The cats are the only issue that might slow us down, but we have scouted out all feline hiding places and are secure in the belief that we can catch and crate everyone very quickly. not our house. Someone else’s. Imagine they are worried re: the view. This map is being updated frequently with evacuations, and the progress of the fire. The fire has just exploded over the last two days, quadrupling in size. 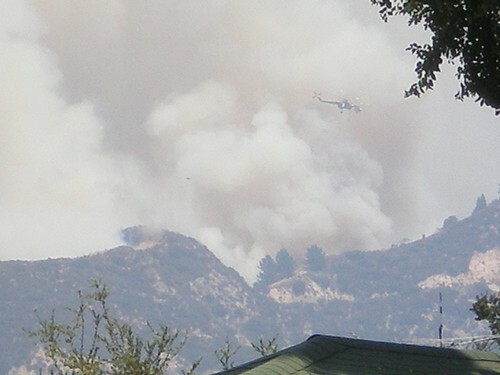 I am very worried about people in the towns of Ravenna and Acton, as well as the folks here in the Foothill communities that are adjacent to us. Mt. Wilson is another problematic area, because the communications array up there is a major hub for most of Southern CA. If that goes down, we’re kind of fucked. Need more info? If you Twitter, then @CalFireNews is good to follow for updates. So is @lafd. The LA Times has good coverage. The City of La Canada Flintridge is posting hourly updates on their city website, though they are .pdf files, and will d/l onto your computer if you click them. Altadenablog.com is a community based resource that is doing a fantastic job of compiling reports, including first hand accounts from residents. Inciweb is another good one. 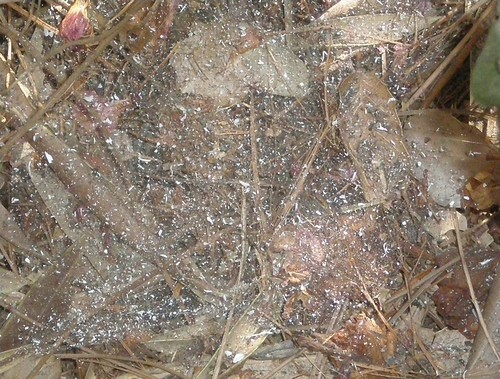 spiderweb in the front yard. I imagine Ms. Spider is not thrilled about the ashes in her living room. Do you want to help? I’m sure the Red Cross could use some donations. I know for sure that the Pasadena Humane Society has put out the call for donations, because they are caring for a LOT of displaced animals right now. If we get evacuated, we have a safe place to take our 6 cats and 1 dog, but not everyone is so lucky. They could use some help. 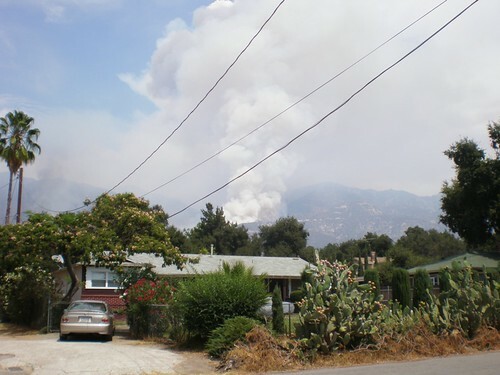 This entry was posted in Family Life and tagged altadena fire, cats, evacuation, mt. wilson, station fire, wildfire, wtfnature. Bookmark the permalink. The ask reminds me of how things looked in Portland when Mt. St. Helens erupted. It is all so very scary and I hope it is over soon for you and the residence of S.California. Dear heaven, Rainy, stay safe? I saw this on the news tonight and immediately thought of you. Keep us as posted as you can, but please, just stay safe. Rainy, it’s good to hear you’re ok so far. Wow, how this brings back memories of my backyard two years ago. And our tv/radio station tower was also on fire but some brave tv people stayed there and kept the fires back, thus saving all the broadcasters antennas.